A scientist at the International Joint Commission said massive algae blooms on Lake Erie are becoming "very difficult to control." Algae blooms are caused by an elevated level of phosphorus in the water. Phosphorus is used in farm fertilizer, lawn fertilizer and everyday products like shampoo and toothpaste. - Blown there by the wind. - Soaking through the soil, entering the ground water and flowing into rivers and lakes. - Rain washes it off the top of the soil and directly into rivers and lakes. Raj Bejankiwar is the lead on the Lake Erie Ecosystem Priority, a branch of the International Joint Commission that is studying algae levels in Lake Erie. In April, he predicted Lake Erie would see near-record algae levels, and he was right. He called this summer "a classic example" of how and why algae blooms flourish. "We have more intense storms, so we have more intense runoffs. And because we have more big storms, the phosphorus runs off and ends up in the lake. So that&apos;s the reason it&apos;s becoming very difficult to control," he said. Blooms are traditionally confined to the summer months, mainly August. 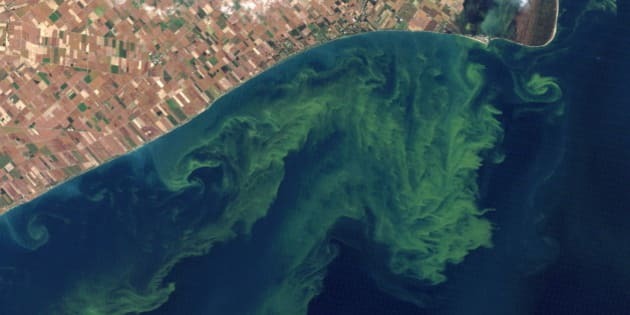 Last year, however, warmer temperatures in March allowed algae to grow earlier in the year, but the bloom wasn&apos;t as big as the one witnessed in 2011. But just last week, in Ohio, toxins from blobs of algae forced one township to tell its 2,000 residents not to drink or use the water coming from their taps. Tests on drinking water in Carroll Township, which is just west of Toledo, showed the amount of toxins had increased so much in early September that officials decided to order residents to stop using the water for two days until they could hook up to another water supply. It was believed to be the first time a city has banned residents from using the water because of toxins from algae in the lake. "It&apos;s a big concern for many people who live on the water," Bejankiwar said. He said "2011 showed how bad it could be." "The entire western basin was covered in green. Charter boats said they were impacted tremendously. Revenue was going down. Tourism took a big hit." But it&apos;s not just about money. Approximately 20 per cent of the world&apos;s fresh water is in the Great Lakes, providing drinking water to 30 million people. "Economics and the environment go together," Bejankiwar said. "If there is no good environment you can&apos;t have good economics." Bejankiwar said it&apos;s not just the farmers&apos; responsibility to help keep phosphorus out of the water. Residents fertilize their lawns, too. So do golf courses. Mike Toth, the superintendent at Erie Shores Golf and Country Club, finds himself in between. He needs to fertilizer the course but also draws water from Lake Erie. "This year has been quite a bit more," he said of the algae. "We have a filtration system in our pump hose and within hours it can plug up our filtration system," Toth said. "It doesn&apos;t stop me from watering but it just doesn&apos;t give me the volume I need." The Essex Region Conservation Authority has a program to help farmers reduce runoff. Landowners are eligible for up to $3,000 in grants to build buffer strips, windbreaks and rock chutes. "I think the big term is that we&apos;re stewards of the land," farmer Mark Balkwill said. "We feed our families and we feed ourselves. it doesn&apos;t do anybody any good if we&apos;re not using sound farm principles."